Note that I haven’t mentioned anything in Italy. Since that country contains seventy percent of the world’s heritage sites I think it would be a little unfair to include anything from it! I’m glad to remark that I can now die happily since all ten on my list have now been seen, the most recent being the Potala palace of Lhasa which I visited earlier this month as part of our journey to Tibet. We waited for our second day before visiting this wondrous palace since it does include a lot of steps to reach the top and it does require a couple of days to get used to strolling about at twelve thousand feet above sea level on just two thirds of the oxygen supply you’re normally used to breathing back home. We didn’t suffer any undue effects since I’d been suggested a Chinese medicine which worked wonders (or was it the placebo effect?). Despite the fact that the Potala has been somewhat isolated from the rest of Lhasa, with the demolition of an old village in front of it and the construction of a grand ceremonial square, this magnificent palace still dominates the city like no other building possibly could. Its massive, but strangely gracious shape, looms ever in the background like a beautiful white and red dragon, supinely resting on the hill after which it is named. Seeing the Potala for the first time is surely one of the noblest sights that can be seen in one’s lifetime. The visit arrangement was complicated: permissions, passports, daily visitor quota numbers, timed tickets and just one hour to see the palace (although I’m sure we spent rather more than that) were happily arranged for us beforehand. Otherwise, it can be like wanting to see Leonardo’s ‘last supper’ in Milan without booking weeks ahead. Be prepared for a lot of sometimes steep and irregular steps. Any effort, however, was whisked away from me by the sheer beauty and grandeur of what I was approaching – the sheer otherworldly nature and exoticism of this former seat of religious and temporal power in the mountain kingdom. People say that the Potala is now just a lifeless museum because its rightful inhabitant, the Dalai Lama, has been in exile for almost sixty years. That’s true and not true, for the Tibetans treat the palace like a shrine and leave their offerings in terms of yak butter candles and little banknotes everywhere and there is a religious quietness about the whole environment. We were so lucky not only with the weather – the white-washed walls (which were being repainted by a bevy of women at the time) stood out brilliantly against a true blue sky of cerulean intensity – but with the fact that we weren’t besieged by too many other tourists, mostly Chinese. We never felt ‘overcrowded’. No photographs are allowed in the interior although one can take as many as one likes from the outside. There is, however, a very good illustrated album one can purchase to show the amazing treasures of the thousand odd rooms which the palace encloses. You could also see the film ‘Kundun’ I’d mentioned in a previous post since much of it was shot inside the palace. Here are a few facts about the UNESCO world heritage Potala. Its two colours divide its main areas: the white part is where the living quarters of the Dalai Lama were housed; the red part is dedicated to religious shrines and chapels, The hill on which the palace is built is called Mount Potalaka and is the abode of Avalokitesvara, a Bodhisattva (i.e. a person who attains Moksha or liberation not for his own sake but for that of all humankind, putting his fellow beings’ liberation above his own). The present building dates from 1646 although it is, of course built on a much earlier and smaller palace. Its dimensions are around one thousand three hundred feet long and one thousand one hundred feet wide. Its sloping walls are over ten feet thick. And its thirteen floors rise to a height of almost four hundred feet. Its top is one thousand feet above Lhasa street level. I was very, very moved by my visit to the Potala with its sudden transitions of darkness and light, its unexpected confrontation with both compassionate and war-like divinities, its thangkas, its still existing living quarters of the fourteenth Dalai lama, its amazing views from the upper windows, its variety of steps, ladders: the surprising changes of level left me with an impression that I had entered into a fantasy-world-dream. For all it mattered I could have stood on a different planet in a parallel solar system. In the afternoon of our first full day in Lhasa we visited Norbulingka. This was the Dalai Lama’s summer palace and was largely built between 1755 and 1783 by the seventh Dalai Lama. The name translates as ‘jeweled park’ and, indeed, the palace, which actually consists of various large pavilions, is placed in a very beautiful park not too far from the Potala, or winter palace. Like the Jokhang and the Potala, Norbulingka is a UNESCO World heritage site. Sadly, it was from the south gate of this palace complex that the present 14th Dalai Lama had to make his escape from Tibet in 1959 when he realized he would otherwise end his life as a prisoner of the Beijing government. Unfortunately, like so much else in Tibet, Norbulingka and its park was damaged during the first years of the Cultural Revolution but since 2003 it has been in phase of restoration and we found the park and palace a great delight after the morning’s hustle and bustle in the Barkhor. Families were out enjoying the wonderful sunshine of Lhasa and there were many picnic places. Again, however, we were too late to see two things: the full splendour of the flowers in the park and the Sho Dun Festival which is held in the middle of August. It’s also known as the Yoghurt festival since the monks are offered yoghurt in an event which includes dancing and pageants. We did, however, see aspects of a film they were shooting using the palace as a backdrop. I wasn’t allowed to take pictures of the film set but took one of some of the extras who were patiently waiting for their next entrance into the scenario. I wonder what the name of the film was. Of course, Chinese films can be absolutely spectacular and riveting. I’ll never forget the first time I saw ‘Crouching Tiger, Creeping dragon.’ Unlike the decaying situation in the west there are on average twenty new cinemas being opened in China every week and a multimillion dollar ‘cinema ‘city’ has just been approved for construction. At the same time, some films like ‘Gundun’ and ‘the Last Emperor’ made from a western point of view are still controversial items under China’s strict political and cultural censorship laws. For me the most fascinating and moving part of Norbulingka was the new palace pavilion built for the present Dalai Llama between 1954 and 1956. It’s sad to think that His Holiness Tenzin Gyatso spent just three years here but everything has been kept or restored exactly as it was when he lived here. Among the Dalai Lama’s tutors was Heinrich Harrer (mentioned in my previous post) who introduced the young lad to western influences and did much to ease his isolation and somewhat formal existence. It was incredible to see the Philips wind-up record player mentioned in ‘Seven Years in Tibet’ and other items including a Russian radio. The walls of the ‘new’ palace are beautifully decorated with over three hundred paintings illustrating history of Tibet and the whole complex is built in a wonderfully traditional Tibetan style. I am so glad that the whole Norbulingka is being restored to its former splendour. Fortunately, the ancient skills still exist for such works to be carried out. I only wish that one day the present Dalai Lama could be allowed to visit the place where he grew up and recognise that it still retains an enormous importance not only for the Tibetans but now for the Chinese themselves. After all, it is part of the extraordinary history of a country and we all know that an Orwellian deletion or re-writing of history means the death-knell of any civilization and its people. I realised I would not expect to see the Lhasa depicted in old black-and-white films. I had prepared myself for a city, which counted just around ten thousand inhabitants in 1950 and which had now evolved into a large metropolis of over half a million people, largely modern Chinese in aspect, with skyscrapers and wide avenues. Landing at the airport this is what seemed to be the case. Would I ever taste even the minutest flavour of a Lhasa, whose name means ‘Home of the Gods’, I’d read about in old travellers’ tales and, especially something of the city people like Heinrich Harrer had spent seven years in? (Incidentally Harrer only died in 2006 and spent the rest of his life fighting for Tibetan rights. There’s a museum dedicated to him in Hüttenberg, Austria – definitely a must-see when I’m next in that country). The skyscrapers around the new railway station which, also in 2006, has linked Lhasa to the Chinese railway network, prognosticated my anxiety that I would come across a thoroughly different Lhasa: a Lhasa where half of the inhabitants would be Han Chinese and where the last thread of isolation from the outside world would be broken in 2020 when a rail-link will connect it to Kathmandu through the world’s longest tunnel, under Mount Everest itself. These fears were there with me and one should always be prepared for them but Lhasa still turned out to be an unmissable place – a city of incredible history, of astonishing life and, underlying it all a sense of deep-seated Tibetan faith and ancient values which are so strongly embedded in the psyche of these wonderful people that it would take a very long time to eradicate them. With inner sadness I would encourage anyone to visit Lhasa for it remains one of the most unforgettable places you are ever likely to stay upon this planet. 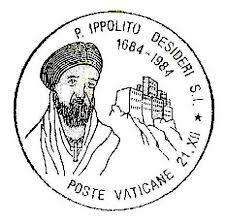 The wonderful thing about Desideri was that he was entranced by Tibetan Buddhist philosophy and tried to reconcile his own strict Roman Catholic beliefs with them. Desideri was given his own chapel at Sera monastic university (more on that later since it is one of the three great Tibetan monasteries we subsequently visited). The ruler of Lhasa at that time was Lhasang Khan who gave Ippolito full permission to teach Christianity and encouraged him to learn Tibetan. How wonderful for a Jesuit to be able to debate with the Buddhist monks of Sera way back in the early eighteenth century and learn their particular mode of dialectic! How amazing to find Desideri compiling the first ever Tibetan grammar for the western world. How pioneering of him to study Tibetan culture for the first time and produce a book called ‘Notizie Istoriche del Tibet’ which described Tibetan customs and culture as he found them during his stay there. Incredibly, this book was not rediscovered in the Jesuit archives until the end of the nineteenth century and was only translated into English as recently as 2010. My wife was also particularly intrigued by her name-sake: an amazing French woman Alexandra David-Néel, explorer, writer esoterist, opera-singer, spiritualist and anarchist who died in 1969 aged one hundred. Alexandra reached Lhasa under cover in 1924. But that’s another story to write about….. There is still a frisson in reaching Lhasa even today when special permits have to be issued and where, regrettably, one is under frequent observation by the authorities. However, it’s really worth it and our first morning in Lhasa beat all expectations and provided us with one of the most remarkable travel experiences of our lives. There is still a part of Lhasa which is thoroughly Tibetan in feel and that is the district of Barkhor, an area of alleys, crowds of pilgrims and many interesting shops. In the centre of Barkhor is Tibet’s most sacred shrine, the Jokhang, which contains the statue of Jowo Shakyamuni, sculpted by artist Vishvakarman under the celestial guidance of the God Indra (c.f. so many Catholic statues crafted under Godly guidance e.g. Florence’s basilica della Santissima Annunziata and Lucca’s Volto Santo). The statue represents the Buddha aged twelve and was brought to this city by Chinese princess Wencheng Kongjo as dowry when she married the Tibetan King Songsten Gampo around 600 A.D. The temple itself is a wonderful place to explore (although photography is discouraged, indeed, almost impossible, since the press of pilgrims, the smoke from the Yak-butter candles and the general mystic darkness of the interior is quite overwhelming). However, anyone who has been into the Jokhang in the morning will understand the impossibility of describing the atmosphere of intense devotion present there. I think I only got near this atmosphere when visiting the monastery of the Black Madonna of Czestochowa in Poland. The force of devotion is almost frightening: truly the fear of God is palpable. Just looking at Jowo Shakyamuni’s face filled me with transcendent feelings that seemed to reach the confines of astral planes. It was truly overwhelming. I also think that since in Lhasa there’s just 68% of the oxygen you breathe at sea level that must have something to do with how I felt! Here are some photos we were able to take of the Jokhang temple. Do note the omnipresence of the Chinese state even in this most sacred place for Tibetans. The red flag flies everywhere and one must go through more than one check-point to reach the sanctum sanctorum. 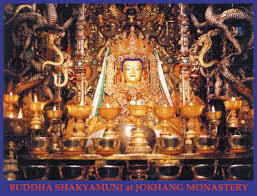 The Jokhang is associated with two kora or pilgrim routes. One is within the temple and the other is outside the temple and circumambulates the Barkhor district. Here are some photos we took of the external route. You’ll also spot that there’s a mosque en route. Muslims like Christians have lived in peaceful co-existence with Tibetan Buddhists for over a thousand years. Oh I wish it were so for so many other parts of this massacred world we live in. Note also the prayer flags, the juniper incense raised from the four great braziers which line the Kora and the prostrations of the pilgrims who come here from all parts of Tibet. Somehow we did find the true Lhasa that morning; our hotel the ‘Kyichu’ was beautifully placed centrally so we could forget the modern city and immerse ourselves into something which those historical travelers must have felt when they first entered the ‘forbidden’ city: forbidden because it used to be so difficult to get to…forbidden because there are still so many unsolved mysteries to be unraveled in Lhasa.